This is the third in a five part series entitled ‘Your Frugal House: Five Ways to Save Money in the…’. We will be looking at five different areas of the house and at five different ways to save money in each area. With all sorts of prices on the rise, and the need to make your money stretch even further than before, frugality is more important then ever. Stay tuned for the next installments, or better yet, subscribed! How much shampoo do you use when you wash your hair? Do you need to use quite that much? Even without taking into consideration the manufacturer’s recommendations to wash your hair twice, most of us are using far too much shampoo. Shampoo and other soaps work largely by making water wetter, which helps strip away dirt. If your hair is already as wet as it can be, then the shampoo is even more effective and you can use less, saving you money. 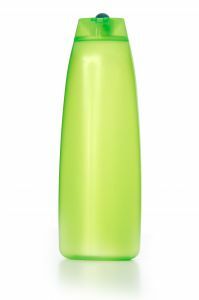 Before applying shampoo, get your hair wet using motions as if you were applying shampoo; this lifts and separates your hair and allows the water to reach it all. Then apply the shampoo, using at most a dime-sized amount. Halfway through rubbing the shampoo in, briefly duck your head under the water again. You’ll be amazed at how clean your hair gets, frugally too. Once again, our old friend vinegar comes back to play. Fill a spray bottle with white vinegar diluted with water and use it to clean the shower walls. You won’t even need to scrub that hard if you’ve used a squeegee to dry the shower walls and doors immediately after use. 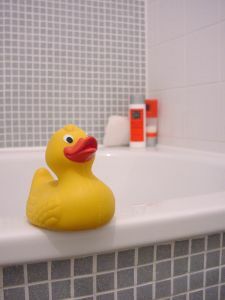 Another frugal cleaning idea that will save you time as well as money is to rub the bathtub with an oil soaked cloth after a bath. This keeps the ring-around-the-bath away. Be careful though! The bath will be slippery though, so use caution, or a good bath mat. Americans are fairly fanatical about keeping clean. The rest of the world doesn’t hold our standards of cleanliness, something I’ve discovered since moving to Europe. (I’m sure you’ve heard the one about there being a reason it was the French who invented perfume.) Try adapting your bathing routine so that you consume less: cleaning products, water or time. If you really can’t give up the habit of your daily shower (I need mine to wake me up in the morning) then skip a step once in a while: wash your hair every other day, for example. It is possible to cut down on the amount of product we use and the frequency with which we use them without offending others’ olfactory glands. Speaking of washing hair, how much money do you spend on hair products? How much would you save if you changed your hairstyle? I’m not saying that you have to go the ‘long hair pulled back into a ponytail’ routine, just that there are hairstyles that are wash and go. It all depends on your hair and what kind of style looks best on you, but sometimes going to a really good hairdresser and getting a classic, easy to maintain hairstyle that only needs to be cut every four to six months really can be the frugal choice after all. You also might want to try cutting the hair of your (male) partner and children yourself. (I know it’s a little bit sexist, but there’s no way I would trust my husband with a pair of scissors near my head- I’m frugal, not insane.) I’ve cut my husband’s and sons’ hair now for several years, and it’s not as difficult as one might think. I’ve gone both the scissors and the clippers route and both are easy to master. A basic hair-cutting set cost me â‚¬20 and has more than paid for itself. Most beauty magazines have this sort of feature, where they compare an expensive product with a more frugal choice. If you do rely on beauty products, pick one that works for you and make it part of your budget, but keep in mind that the majority of the time the frugal beauty product comes up just as good as the splurge. When I was in the United States I washed my face with Cetaphil, a very gentle face cleanser. One day I tried the generic store brand and there was no difference whatsoever; I never looked back. If you are particularly attached to a brand name product, trying making a conscious effort to save the difference in price elsewhere: a cheaper shampoo, the generic lotion etc. For example, I love the smell of Pantene shampoo and conditioner, so I splurge on myself with these two products. They are about â‚¬2 more than the generic version, so I try to make up the difference by buying generic everything else. What are your frugal tips for the bathroom? Share them with us in the comments! And make sure to stay tuned for the rest of the week’s installments, or better yet, subscribed! Great tips! I, like may women, like beauty products so this is one area I try to not overspend in. I have found that along with your tips making sure I use every last drop of something before I buy a new one helps, and I try to buy a few of the products I know I really, really like (for example, the face makeup I use is a little expensive, but my mascara, face wash, and face lotion all cost less than 7 dollars). A comment from the Dollar Stretcher e-zine a few months ago changed the way I wash my hair. To wash, dissolve 2 tbsp of baking soda into water, rub into hair, and rinse. To condition, mix a few tbsp of apple cider vinegar into water and rinse. I also take navy showers, turning the water off after I get hosed down really good, so I can wash, soap up, and shava zee legs. Then the water goes back on to rinse and condition. And we do this every other day – you'll be shocked how the baking soda keeps your hair from looking greasy, even up to 4 days (but you didn't hear that from me). You have to be pretty passionate about saving money to do this in the winter, especially since we set our heat at 55 degrees. Can you say "popsicle"? Brrrrr! I’ve been cutting my husband’s hair for years! I now cut Elijah’s too! They both like the military cuts – so it’s easy. The clippers cost about $20 and they last about 2-3 years. So I save on the cuts plus the gas to get to t he barber. My daughter’s hair is long – all one length. We get hers trimmed about every six months. I go once every 3 months. Good tip about the oil soaked cloth. What kind of oil? I’ve tried it with regular baby oil, but I’ve heard that you could also use vegetable oil. I don’t know how much I’d be willing to risk the tub smelling like French fries however! I just discovered your site just yesterday, and decided to throw in my nickel. Interesting observations, specifically, cutting family members hair. I started doing that when my sons were two and four. They didn’t like going to the barber with their dad, so I decided to do just that. It wasn’t the best style at first, but they didn’t really know or care. They haven’t been back to a barber since then. Now their 25 and 22, and I still cut the older one’s hair and the youngest has his own style and is able to do his own hair. So the moral is that we’ve saved thousands of dollars, from them not having to go to a barber. Touche’ to being frugal! Suzy’s last post……Out in the Ether Again! Wow Suzy! 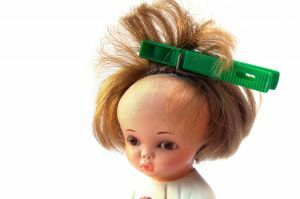 I’ve only saved a few hundred euros by cutting my kids’ and husband’s hair, but they’re only (the kids at least) four and five years old. I am really enjoying these posts. I’m not a beauty products junkie but I do love Bath and Body works bath gel. That’s my biggest splurge. You know, I’ve never stopped to think about how shampoo actually works. That’s a great tip and one I plan to try tonight! Suzy´s last blog post..Happy Easter!